Although 2019 marks Hermès’s sophomore appearance at SIHH, it’s fair to say that the equestrian luxury house has already established a formidable reputation. 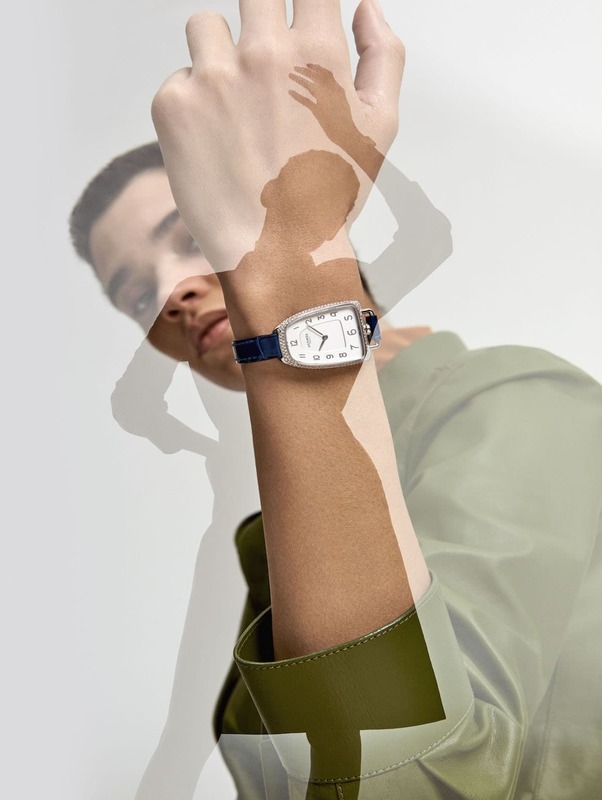 Every year its designers create curios which defy the formalism of the Swiss watch industry, instead embracing the kind of whimsy which showcases their expertise in all things art directed and multidisciplinary. These credentials were immediately evident from Day 1, when media began visiting the brand’s SIHH booth. In most cases, exhibitors will decorate their assigned spaces in a manner that is literally representative of their star novelty (e.g. a supercar at Roger Dubuis or fighter aircraft at IWC). By contrast, Hermès enlisted the aide of Japanese designer Hideki Yoshimoto, who created a 3.5-metre installation at the centre of the booth’s atrium constructed from 20,480 photovoltaic tiles and superimposed against a milky light wall. The slowly rotating work was an oblique reference to the Arceau L’heure de la Lune — a watch which incorporates two similarly shaped satellites into its inventive double moonphase complication. 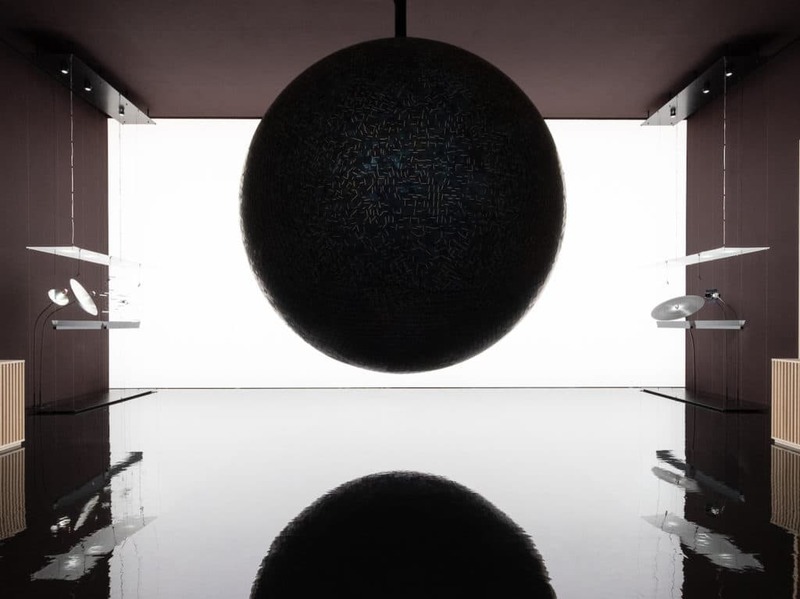 Beyond functioning as a clever preview of Hermès’s most well-received novelty this year, the installation is symbolic of a wider commitment to watch design that is original, irreverent and (as is more often than not the case) commercially appealing. 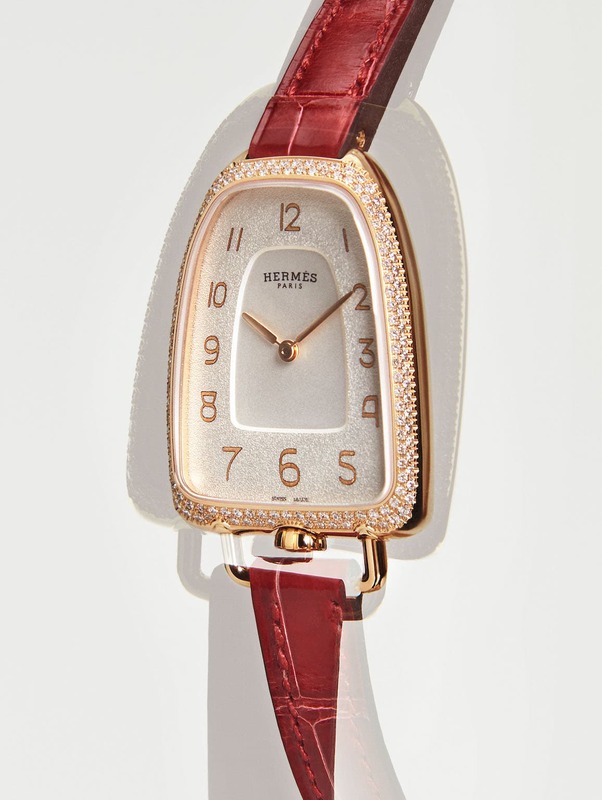 “We work seriously, but don’t take ourselves seriously,” said Hermès watches CEO Laurent Dordet. “It’s the reason why we often don’t collaborate with traditional watch designers.” On that note, rather than rehashing old ground by covering the now well-documented Arceau double moonphase, let’s take a look at one of the maison’s less well known new releases — the Galop D’Hermès. Available in two metals with or without gem setting, the Galop is being positioned as Hermès’s entry level timepiece: a functional design object which evades the label of “marked-up fashion accessory” thanks to the fastidiousness of its creator, Ini Archibong. Pictured: the Galop d’Hermès in non-gemset rose gold (HK$83,700). Development on the Galop began three years ago, when Hermès artistic director Pierre-Alexis Dumas approached Archibong with the idea to create a timepiece encapsulating the maison’s equestrian heritage. 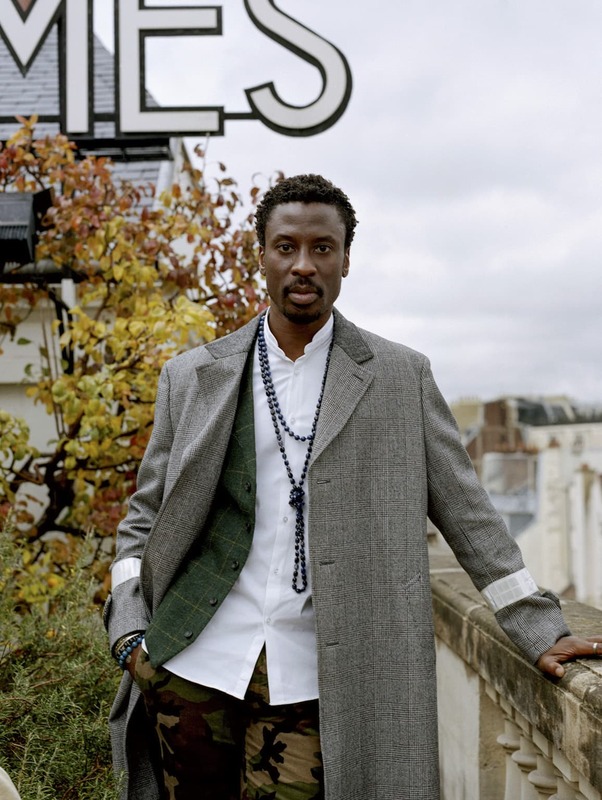 Upon accepting the brief, the Nigerian-American designer’s first priority was to visit the Conservatoire des créations (Hermès’s Parisian product development centre), where he documented an exhaustive archive of bits, stirrups and harnesses which would serve as references for the project. Horological formalists — who so often sacrifice a coherent visual style in favour of mechanical performance — might balk at the appointment of Archibong, an environmental designer with zero experience in high watchmaking. As an outsider however, Archibong has been able to sidestep the tendency of many watchmakers to create inside a cultural vacuum. Often occupying a space squarely between fantasy and reality, his previous designs — many of which begin life as sonically fuelled freehand sketches — have all been steeped in cultural motifs drawn from his Nigerian ancestry and Californian upbringing. And while the Galop does capture the essence of the brand’s history as a maker of fine equestrian leather goods, it cleverly references many of the themes — sci-fi, architecture, gender identity — which have informed Archibong’s own process over the years. 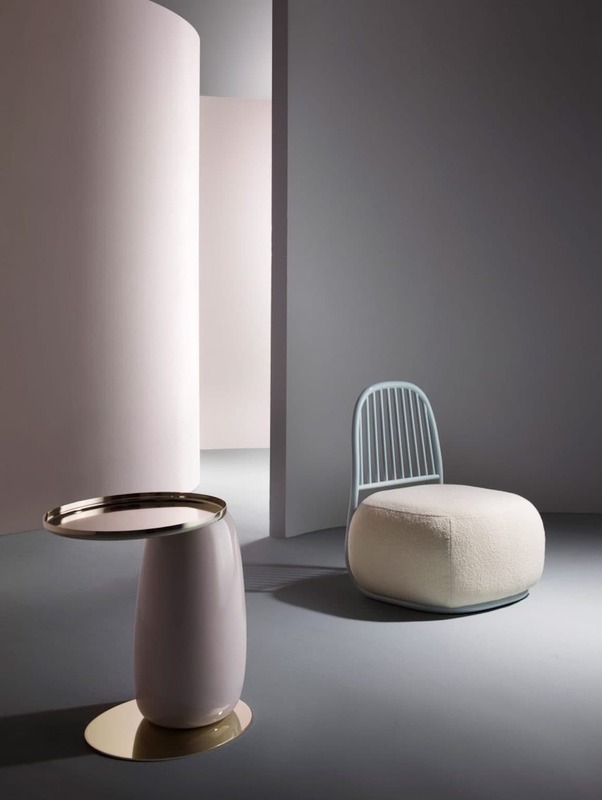 Pieces from the 'Below The Heavens' collection - a collaboration between Archibong and European furniture brand Sé in 2018. A graduate of ECAL, Archibong is better known to design boffins for his eclectic creations like the Orion table and Vernus lamp. 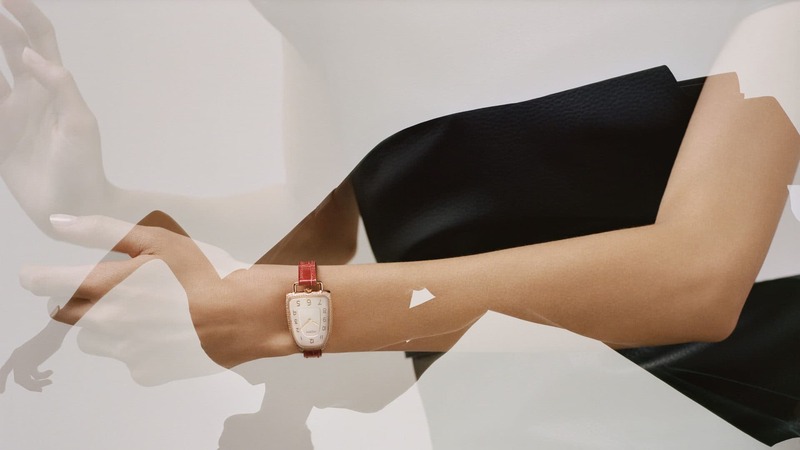 A shift in perspective is all that’s required to transform the Galop from spaceship to stirrup — a visual metaphor for the venerable yet forward looking Montres Hermès. Upon initially seeing the Galop in the metal, a number of visual impressions sprang to mind: in profile, the watch resembles a kind of retro-futuristic spacecraft, tracing a subtle arc from 12 to 6 o’clock. From the side it takes on a whole new guise: light gleams along the flanks, suggesting a golden arch, gangway, or some other bridging structure. Turn your attention to the strap, and you’ll see the design element that is most explicit: a stirrup shaped lug, enclosing the winding crown that is inset at 6 o’clock. This confluence of forms is achieved by removing the extraneous, and so it makes perfect sense that the Galop — demonstrably intended as a platform for Archibong to explore certain aesthetic ideas — is powered by quartz. The aforementioned crown too is relocated, so as to maintain an uninterrupted surface area upon which light and perspective can intermingle. To simulate a galloping motion across the dial, Archibong worked with Hermès’s designers to create an idiosyncratic typeface. Indexes start small and gradually enlarge in chronological order, so as to simulate visual depth. 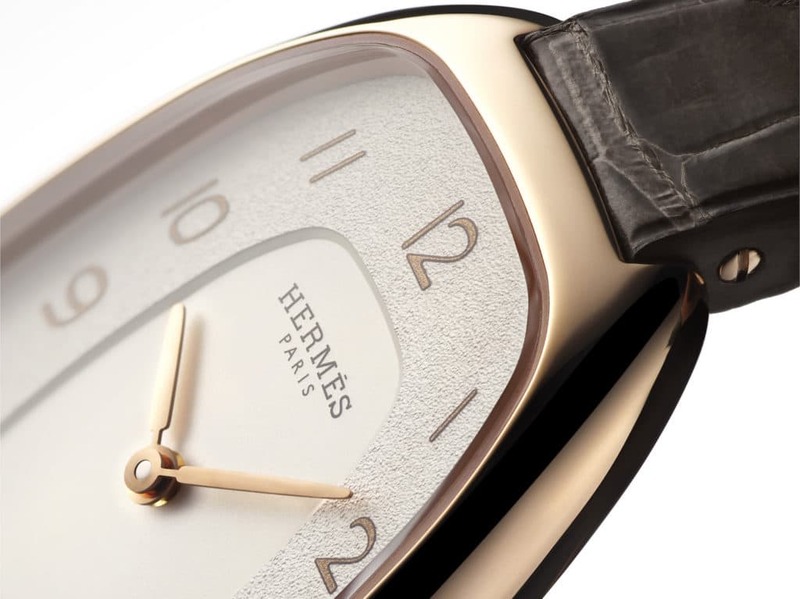 On the dial, the creative influence of Hermès comes more sharply into view. Calligraphy has always been a specialism of the maison, and the Galop’s two-texture dial — combining grained and opaline surfaces — is an effective setting for its original typeface, intended to express the feeling of forward motion through balletic roundel numbers. These indexes are applied using a powder transfer — silver for the stainless steel timepieces and gilt for the rose gold — that is then delineated using grey contour. The “4” and “8” indexes are especially whimsical, as they incorporate constituent shapes which are themselves similar to stirrups. Art historians call this mise en abyme — the technique of placing an object inside itself in order to produce the effect of an infinite sequence. This being Hermès and all, each Galop release is available on a variety of polished alligator leather, with the stainless steel variants getting the lion’s share of choice thanks to the addition of natural or black barenia calf straps. 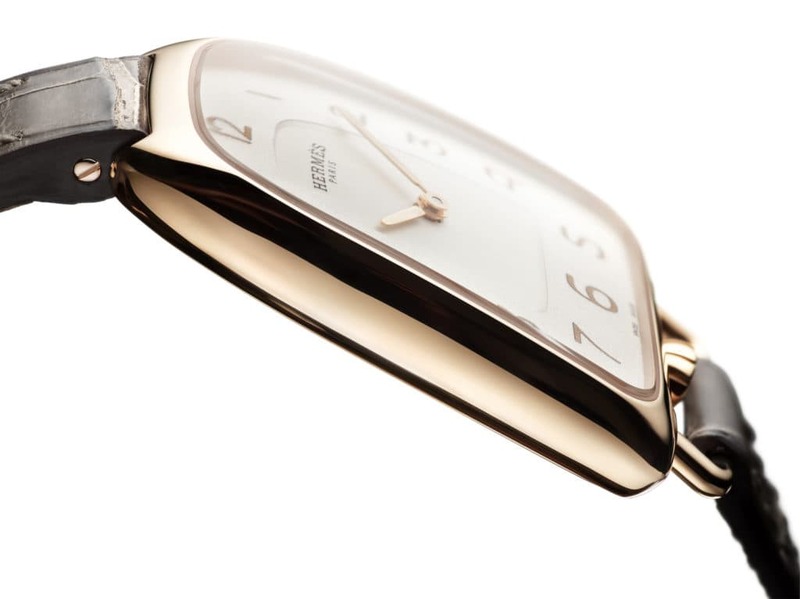 Pictured: the rose gold Galop, with gem setting. Pictured: the stainless steel Galop, with gem setting. 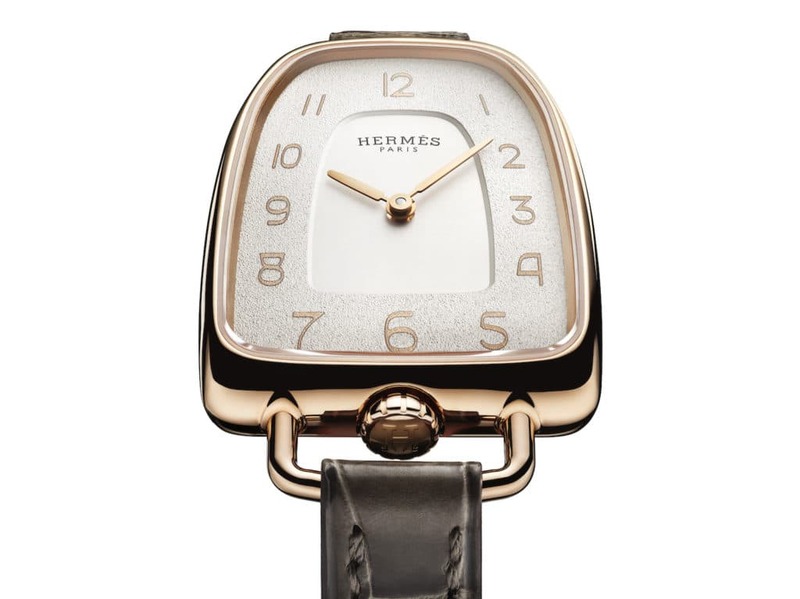 The Galop D’Hermès is available in stainless steel (HK$36,000) or rose gold (HK$83,700) with or without diamond setting (HK$82,000; HK$137,000 respectively). To learn more, visit Hermès online.